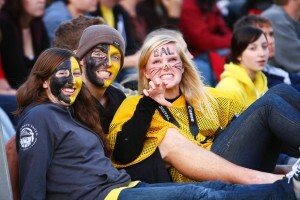 Students enjoy Wickwire field. Photo by Pau Balite. The Dalhousie Gazette set up a booth at the field party in the Studley quad Sunday afternoon to kickoff Orientation Week for incoming Dal frosh. We tasked frosh students who came by our booth with writing mini-articles about whatever crossed their mind as they embark on a new stage of their life. “I love water fight!” –Riddhi Shavna.